Ah! My old friend the 8″ Newtonian Reflector. I bought this Skywatcher 200P f6 as a Dobsonian-mounted Skyliner. It’s served we well, and is a fantastic piece of kit. The focuser has been recently tuned up. I stripped it down and removed the nasty Synta grease, tuned it up and re-greased. Much nicer to use now! The optics in this scope are superb. 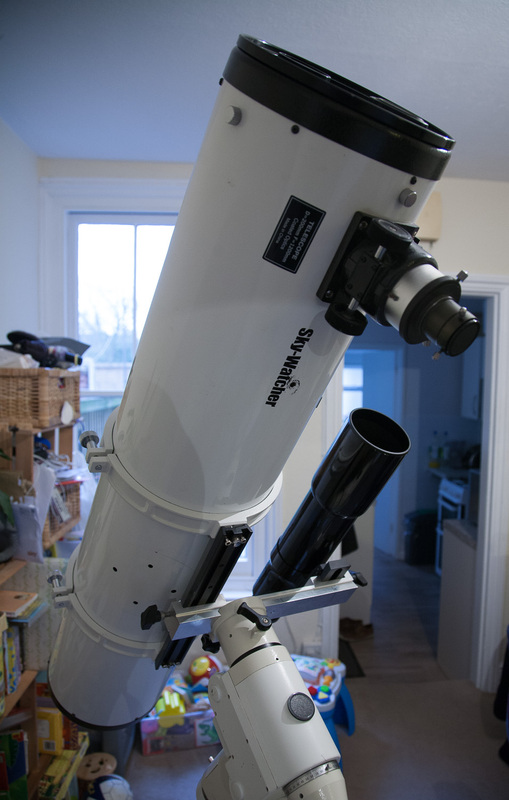 I’ve cleaned the primary mirror once in its lifetime (extremely carefully I might add, using distilled water, and cotton wool – there are some great tutorials on how to do this on YouTube – basically, you don’t need to do it often!). In 2012, I went through the process of ‘DeDobbing’ it. I wanted to mount in on my newly-acquired HEQ5 Pro, so I removed it from its base, and removed the bearings from the sides. 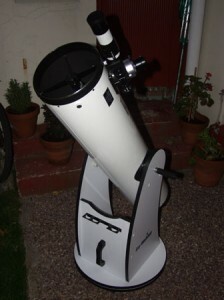 I then mounted it (using the proper Skywatcher scope rings and dovetail), to the HEQ5. This setup works extremely well, and is a fantastic GoTo visual device. It’s not quite so friendly for imaging purposes, though can be used. It does take considerably more accurate setup and balancing than the 80mm Refractor I have when imaging. Visual setup, however, is a doodle. I am considering replacing the bearings, possibly adapting them to include some sort of ‘Quick Release’ mechanism. This would allow the scope to again be used on the Dob base. The reason for this is that sometimes, its nice to be able to have a quick setup for visual use, especially where my children are concerned.